A Spelling Bee game helps you learn how to properly spell medical terms for charts and transcription. Lots of pictures to show you what the terms mean. Learning medical terminology couldn't be easier. Listen as the word is said and then record yourself saying it. Play it back and compare it to the expert! Practice it until you sound like a pro! with no grades and no one looking over your shoulder! This is your own personal course that you can study in the morning, late at night, or during your lunch break - either use the CD with a computer or just use the worksheets in the book. Listen to a short presentation about this product. Now you can learn medical terms faster and easier with this step by step printed book and interactive CD! You'll learn the words used in doctors offices, clinics, hospitals and alternative medicine. Everything needed for a self-paced medical terminology course is included. Listen to the words pronounced, get spelling assistance, work through exercises, self-tests, and games. Learn prefixes, suffixes, root words, stem words, anatomy words, medications, and abbreviations. (Does not include coding for billing). Get started in your nursing career, medical transcription career, medical office assistant career, physicians assistant career, or medical billing career by learning how to spell and pronounce medical terms. Used as part of medical transcription training and medical coding and billing courses. However, this book does NOT include medical codes. Why wait? Get started in your medical career now! Many students having difficulty in regular classes buy this to learn more on their own! Medical Terminology Book with Interactive CD Learning Tools! The most effective form of learning. By combining text, pictures, audio, and interactive exercises, you LEARN FASTER and RETAIN MORE. Yes you can learn Medical Terminology! This is what you see when you put the CD into your computer. The tools are simple and easy to use. Build your knowledge step by step, at your own pace. After mastering these techniques, you can comprehend any new medical term faster. Listen and then practice saying medical terms - record yourself and compare it to the instructor! The built-in Audio Training Tool assures you are pronouncing the terms correctly. Identify human body part names associated with the term - illustrations clarify the concepts. Master the correct spelling of medical terms with the spelling bee. It is fun and you can impress your boss or doctors with your ability to correctly spell those complex terms! Learn the roots of medical words and then be able to apply them to any new word you see. Understand the meaning of medical words - a medical practitioner provides expert narration. The Medical Terms Book is Enhanced with Pictures and Written Activities and Interactive Games on the CD. Using a step-by-step programmed learning sequence, medical terms are presented so that it speeds up learning and provides several methods to help you understand. There is an interactive medical terminolgoy quiz and game that makes it fun. This approach allows you to start at any point and only learn the concepts you need. This book teaches you how to study, provides practice, and gives study secrets, practice exercises, and self-check quizzes to ensure your success! Unlike other methods, this Book with CD gives an in-depth understanding of how medical terms are derived from simpler terms. This greatly enhances your ability to understand medical terminology in general. It doesn't just teach you lots of words, it helps you understand how words are put together. created by top medical experts for a self-paced medical terminology course. Medical Terms - as part of learning a prefix or suffix, you learn the terms where it is used. Knowing medical terminology is a valuable job skill! This self-paced training may provide entry into many different medical careers - a medical transcriptionist, a medical assistant, a medical coder, a hospital entry level position, to get into a nursing program, or entry into many of the alternative medicine jobs. 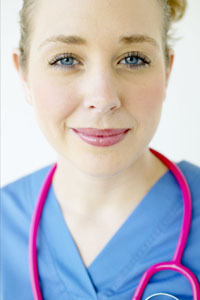 Our unique Audio Training Tool allows you to listen to the medical terms spoken by a medical practitioner. After listening to a term, you can record yourself saying the term in a medical sentence. This way you master how to say the medical term and how the term is used. Your audio recordings are saved ...So you can easily see how much you have improved over the entire course, or you can copy them to a CD and turn them in for a grade in a college or hospital course! The To Do List tool on the CD helps keep you on track by recording the lessons you have completed and when you complete them. You just enter in your dates for the schedule. Activities are then color coded to visually identify your progress: Red for past due, Yellow for activities due within a week, Gray for complete, and White for activities due in the future. 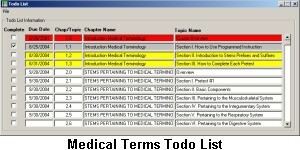 The Todo list can also be emailed to a sponsor or instructor to help guide you through the medical terms course. You can print or e-mail this report to your supervisor to show how you are progressing through the materials! Master the correct spelling of medical terminology in this fun educational game. The Medical Spelling Bee tracks scores, gives hints and you hear each word said before you spell it. You listen to the term, type it in, and click a button to have it check your spelling. You are immediately told whether or not it is correct. It also keeps score of how many you got right the first time! Just like the other exercises, when you type in the word in this Spelling game, it helps you remember more, retain it longer, and reinforces the parts of each word! It is a proven, effective way to rapidly increase your skills. If you don't get it right the first time, just do it again and again. No one but you will know how many times it took until you got it right. You might surprise yourself at how rapidly you learn! Use it alone or with the pronunciation guide to learn how to say the terms. This material was adapted from a very popular military course, and has been proven to work - especially for those who know nothing about medicine! This package is used as a textbook for self-paced and distance medical terminology courses at colleges and hospitals across the country. - Schools and Hospitals - Contact us at 541-535-5552 for discounts on quantity orders of 20 or more. PRICE: $36.00 book with CD Regular Price: $70.00 (SAVE ALMOST 50% off) for a limited time. We keep your information secret, we do not sell or distribute any information about our customers. Or call 541-535-5552 to order by phone. Click here to learn medical terms. View a sample interactive exercise from the CD that comes with medical terminology Deluxe Edition. See how easy it is to use, and hear the medical terms pronounced. With this programmed learning method you'll be sounding like a pro in no time! Order Securely Online or Call 541-535-5552 to order by phone. We guarantee all our products. If you are not satisfied, send the product back within 15 days for a refund. We also provide technical support by phone or e-mail. We treat you the way we would want to be treated. We keep your information secret, we do not sell or distribute any information about our customers, and you won't get other unwanted emails from us.